Food is always a good incentive and encourages socialising, for example, you could try an evening café-style service- Young people love the contemporary café-style twist!! Joint events, advertising and networking with other Churches also encourage the youth and is great for them to meet other young Christians. Ask the youth what they would like to do – sports, worship, beach BBQs, crafts etc. Building relationships with them is important – be approachable! We are proud of our identity as a youth group, but we are also proud to be a part of the Church all together. It would be great to find even more ways to worship together. 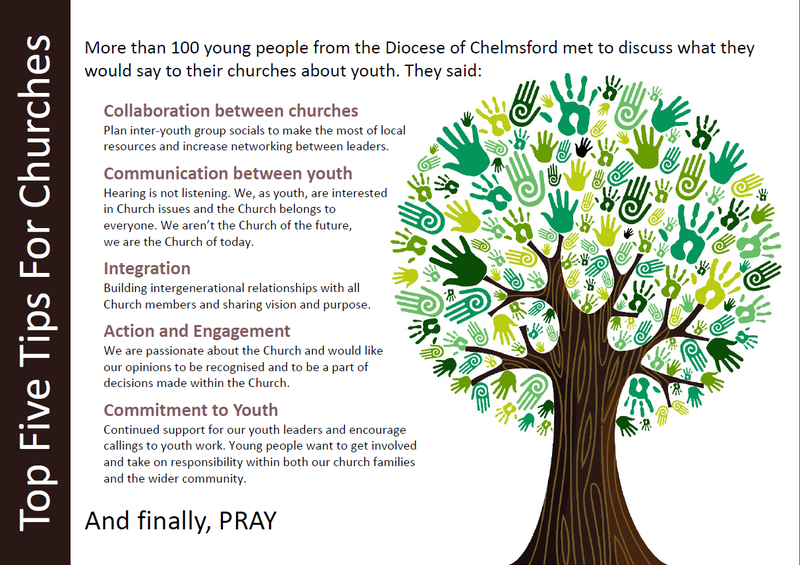 Church leaders – we love it when you take an active interest in the youth work. We know you are busy but we are a part of the Church, please give us the opportunity to get involved too. We appreciate the traditions of the church, and want to support the leadership; but we as young people would like more variation in the style of worship and various aspects of church life. Nothing particularly new or revolutionary, but good, solid, basic, simple, achievable advice. There's a time to talk and there's also a time to listen.